OMEGA’s PX1004 and PX1009 Sputtered Thin Film Pressure Transducers are designed for high temperature applications. 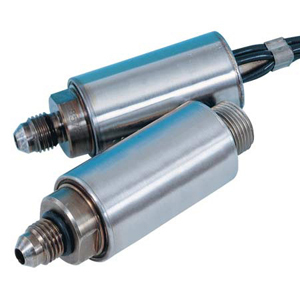 These transducers can operate in temperature ranges from -65°F to +450°F or +650°F. Yet, even in these difficult high temperatures, they provide outstanding accuracy, long-term calibration stability and reliability. Static accuracy is ±0.25%, and thermal zero and sensitivity shifts over their compensated range are less than ±0.01%/°F. OMEGA’s thin film technology makes this premium performance possible. The strain gages are sputter-deposited, forming a molecular bond with the substrate. There is virtually no shift, drift, or creep to cause the transducer’s calibration to change. The all-welded stainless steel pressure cavity and double-isolated case ensures pressure integrity and reliability in these tough environments. These high-temperature transducers are available in many standard ranges from 15 psi to 10,000 psi (specify gage or absolute pressure). A NIST traceable calibration record is available for these units. Note: Ultra-High Temperature PX1009 Transducers are built to order. Check with sales for availability. 注: (1) Metric Ranges Available - Consult Engineering. (2) Mating connector for PX1004 sold separately. Model number PCS06E10-6S, $135.00 each.